If you’re a first-time homebuyer, you might find yourself surprised by the amount of space that you have to fill in your new house. 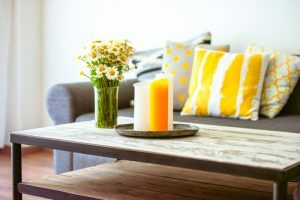 Individuals and families who are making the transition from apartment-dweller to homebuyer are often overwhelmed by the decorating needs of their new situation. It becomes even more alarming when you learn how easy it is to spend thousands on the furniture and decoration in just a single room! Here are some tips to help you turn your new house into a home… without taking out another loan! Take your time: We know! It’s exciting to move into a new house. And if you’re one of those people who’s been saving up ideas on a Pinterest board for years, you’re probably eager to transform those empty spaces. But building your home decor can take years! Get the essentials in place, and then keep an eye out for deals and sales for other items. Browse flea markets now and then, cruise your local garage sales each weekend over the summer, and keep an eye out on marketplaces like Craigslist, your local paper’s classifieds section, and even Facebook’s Marketplace for lightly-used, discounted furniture and decor. A new couch set can cost thousands of dollars. But the odds of you finding a solid set for half the price or less are pretty good if you take your time. Learn to love minimal: You don’t need to cover the surface of every wall and every inch of your floor with decorations. In fact, there’s a lot of beauty in minimal style. Take a leaf out of the Japanese design book and learn to love empty spaces. Choose just a few elegant pieces, and maybe even embrace floor cushions over chairs for a while! Buy a blank canvas and try out some art projects that will look good even if you don’t have an artistic bone in your body. For example, you might try chevron stripes using painter’s tape, or show an ombre color panel just by painting streaks in different shades. Cut out different items in various shapes and make a cut-and-paste project on your wall. For example, you could cut hearts out of paint samples and line them up in columns and rows. You might cut out washi paper or even wrapping paper into large circles and create a confetti effect on the wall. Make a wall hanging out of fabric pieces. Just mount them to frames. Create a frame out of nails, and then wrap string and/or a string of twinkle lights around it to make a beautiful statement that can be as large or small as you want. If you don’t want to go the DIY route for wall hangings, consider looking into some cheaper options to make your walls interesting. For example, you could explore vinyl stick-on options, which are often inexpensive, and give you some artistic license. You might choose an interesting wallpaper pattern that needs no extra embellishment. You might also add tall features in your room which will add visual interest to the walls without needing to add anything. For example, tall plants like a ficus tree, or standing lamps can all fill a space well. Consider a fun refurbishment project. Even small items of furniture, like accent tables or bookshelves, can be really pricey. Instead, put your creativity and elbow grease to the test. Explore some homemade options for the furniture you need (this can be especially fun with shelves) or purchase old versions that are in disrepair and give them new life!